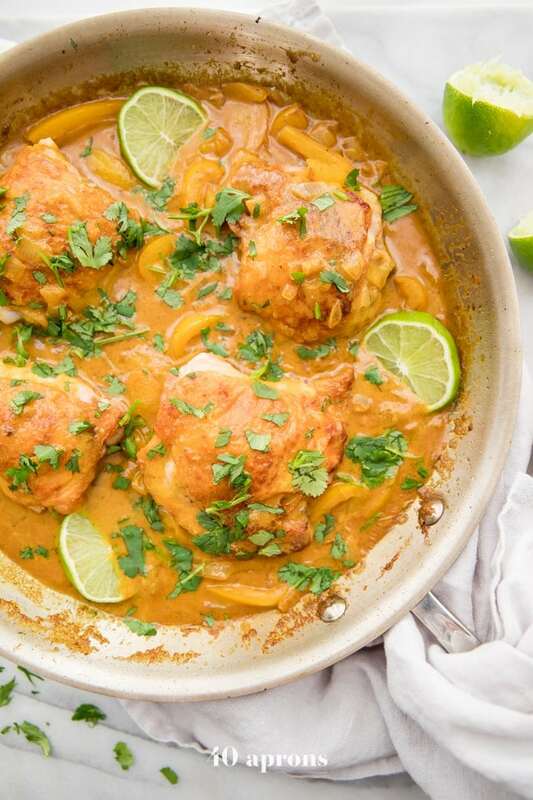 This coconut turmeric chicken is such a rich and creamy dinner recipe. Loaded with anti-inflammatory turmeric, this Whole30 chicken dish is full of flavor and super easy to make. Dairy free and paleo, too. Years ago, I had this boyfriend who told me he loved yellow curry. I bought a giant tub of the stuff at the Asian market, we broke up, and that was kind of that. Except it wasn’t, because I carried the unopened container from apartment to apartment, all the way to the condo where I met my husband, then to our starter home, then to our home-after-starter-home home. Luckily, the yellow curry inside was vacuum sealed and antiseptic bag within the tub, just begging me to take it space once Elon Musk invites us aboard Falcon Heavy. Or maybe I should have saved it for the zombie apocalypse. You know, equally likely scenarios. Instead, I got inspired by my obsession with anti-inflammatory turmeric to pair the blazing yellow spice with the equally saturated curry paste. Add a squeeze of lime juice, some naturally sweet coconut aminos, salty fish sauce, and rich, creamy coconut milk, and you’re perfect. Of course, all of this starts with my perfect pan seared chicken thighs: tender and juicy, perfectly cooked, with crispy skin. 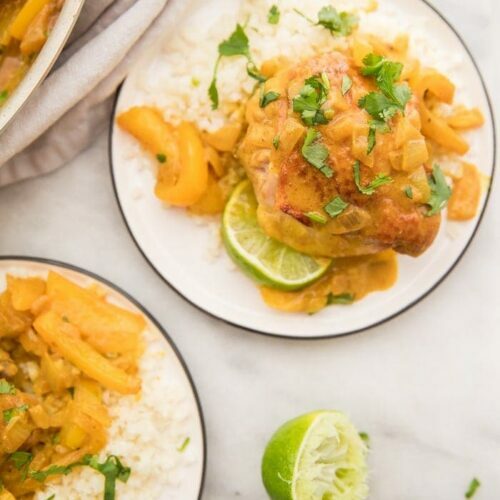 This coconut curry turmeric chicken recipe follows a couple simple directions, making it an easy weeknight dinner. Searing the chicken thighs before making the sauce creates such tender, flavorful chicken. The combination of a bit of yellow curry with fresh lime juice, coconut aminos, anti-inflammatory turmeric powder, and rich coconut cream makes the most flavorful sauce. The addition of fresh black pepper makes the turmeric’s curcumin more easily absorbed into the bloodstream. Why add turmeric in recipes in the first place? Turmeric contains curcumin, which is extremely anti-inflammatory and is a powerful antioxidant. That means lower risks of cancer and other diseases and improvements in those with arthritis. Curcumin also improves heart health and could reduce your risk of heart disease by improving the endothelium, or lining of your blood vessels. One study found its consumption as effective as exercise! Uh, yes, honey. In addition, curcumin is linked to a lower risk of brain diseases, as well as to improved brain function. That might mean improved memory and a lower risk of conditions like Alzheimer’s. And, of course, it’s delicious and so easy to incorporate into everyday recipes, like this coconut curry turmeric chicken or my iced golden milk turmeric latte. Looking for more info on the benefits of including turmeric in recipes? Check this article out. Swap the chicken for shrimp: season the shrimp with salt then sauté them quickly, stirring frequently, in the hot pan with the coconut oil. Cook until just pink and cooked through then transfer to a plate. Continue with the rest of the recipe as written. Use a can of coconut cream for an even richer sauce. Try red curry paste in place of the yellow curry paste. 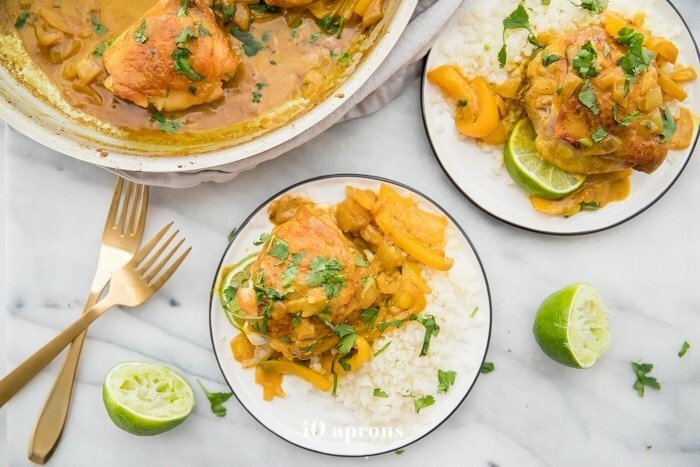 You might end up with a somewhat orange version of this coconut curry turmeric chicken recipe, but no matter! Try boneless skinless chicken breasts. You won’t need to finish roasting them in the oven, just sear them in a large skillet with 1 teaspoon coconut oil over medium-high heat for a total of 8 minutes or until cooked through. Add a variety of other veggies, from Thai eggplants to mushrooms, for an even healthier dish. Don’t move your chicken thighs when searing them skin-done. This is how you get beautifully golden brown and crispy skin! Make sure you use Whole30 fish sauce if you’re on a Whole30. Red Boat is the go-to! Heat your coconut oil in a large, oven-proof skillet over medium-high heat until hot. Season your chicken thighs with plenty of salt then carefully place them skin-side down in the skillet. Don’t move them! Sear for about 7-8 minutes without touching, or until skin releases easily from the pan and is beautifully golden brown. Turn the chicken thighs over and bake in a 375º oven for 19-20 minutes. Carefully remove and transfer the chicken thighs to a plate. Make sure you use a potholder from here on out; the handle of your skillet will be very hot! Pour off all but about 2 teaspoons of fat from your skillet. Add the yellow curry paste and sauté until fragrant, then add your onion and bell pepper and sauté until softened, about 5 minutes. Stir in the coconut milk and turmeric and bring to a boil. Reduce heat and simmer until thickened and reduced by about half. Stir in your fish sauce, coconut aminos, and lime juice. Season with salt to taste. Serve your chicken thighs over cauliflower rice, top with plenty of coconut curry turmeric sauce, and garnish with fresh chopped cilantro. Did you make and love this recipe? Give it your review below! And make sure to share your creations by tagging me on Instagram! 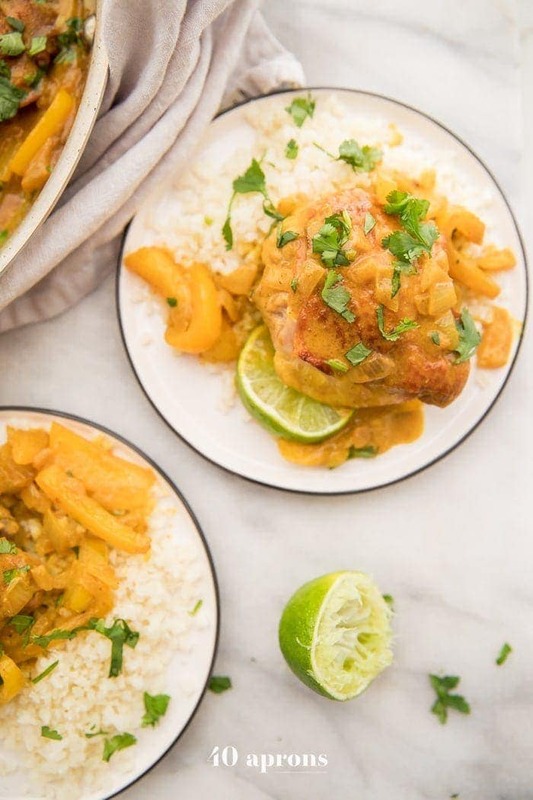 This coconut curry turmeric chicken is a rich and creamy dinner recipe. Loaded with anti-inflammatory turmeric, it's full of flavor and easy to make. Dairy free, Whole30, paleo. Heat your coconut oil in a large, oven-proof skillet over medium-high heat until hot. Season your chicken thighs with plenty of salt then carefully place them skin-side down in the skillet. Don't move them! Sear for about 7-8 minutes without touching, or until skin releases easily from the pan and is beautifully golden brown. Pour off all but about 2 teaspoons of fat from your skillet. Add the yellow curry paste and sauté until fragrant, then add your onion and bell pepper and sauté until softened, about 5 minutes. Stir in the coconut milk and turmeric and bring to a boil. Reduce heat and simmer until thickened and reduced by about half. Stir in your fish sauce, coconut aminos, black pepper, and lime juice. Season with salt to taste. Serve your chicken thighs over cauliflower rice, top with plenty of coconut curry turmeric sauce, and garnish with fresh chopped cilantro. We loved this curry tonight! I have a curry loving husband and semi-picky young kiddos. Thanks for a great recipe! This chicken is awesome – I never knew how to make such a perfect crisp on that chicken skin! This chicken is bursting with flavor. I added some toasted cashews just for a little crunch – but honestly, it needed no addition. Absolutely perfect. I have loved every recipe I have ever made of yours – and I have made quite a few. My husband and I are on the whole 30 right now, and your recipes make us feel spoiled instead of feeling like we are substituting with something just not quite right. You know how to create such flavorful and unique meals that are presented so appealingly. Your recipes will be sticking around long after we finish. I think your recipes have made up at least half of my months plan. Thank you for sharing your gift with the world. This made my day! Thank you so much!